Hosting a Christmas party this year? Why not treat your guests to these bite-sized mouthfuls of festive loveliness? Peel and chop the parsnips into eighths and boil in salted water for 25 minutes. Gently fry off the garlic in the Pomora extra virgin olive oil. Drain the parsnips and add the garlic and oil. Add the Pomora white truffle flavoured oil and salt and black pepper to taste and mash together thoroughly. Slice the ciabatta and toast in a hot griddle pan for 2 minutes on each side. 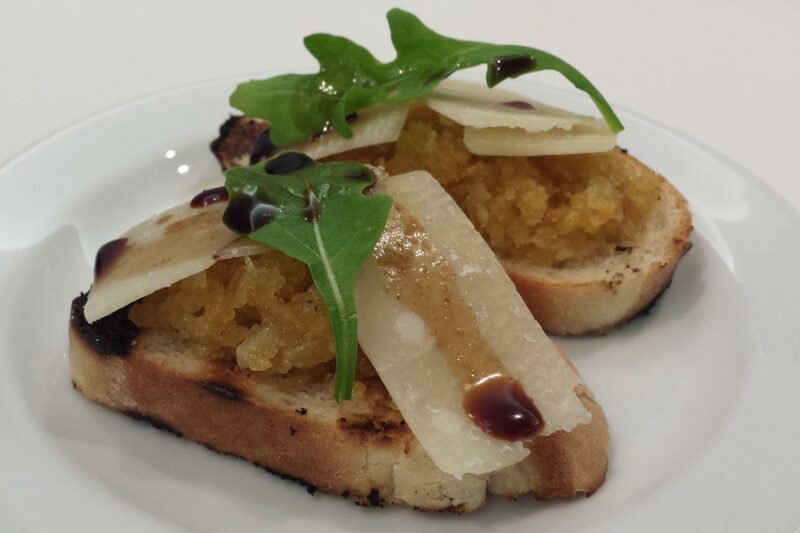 Spoon the parsnip mash onto the ciabatta toasts, add a couple of parmesan shavings and a sprig of rocket and finish with an extra drizzle of Pomora white truffle flavoured oil and a splash of balsamic vinegar. Delicious!